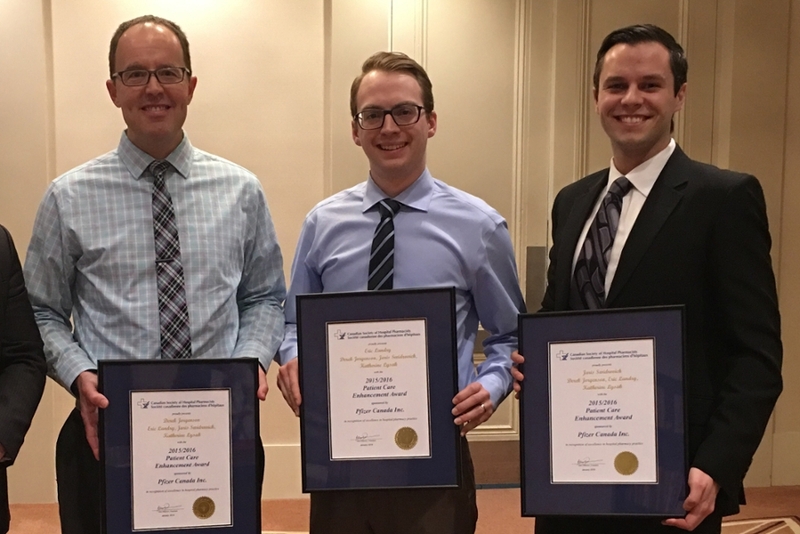 The Medication Assessment Centre (MAC) received the Patient Care Enhancement Award from the Canadian Society of Hospital Pharmacists (CSHP) on January 31 in Toronto. MAC received the award based on their submission which highlighted how the centre provides easy access for patients to medication assessments, while helping both healthcare professionals and students learn more about medication therapy. Two awards are presented annually at the CSHP Conference to recognize projects or programs that help ensure patients are receiving the best possible medications, and improve healthcare professionals’ understanding of medication therapy. Embedded in the College of Pharmacy and Nutrition, MAC provides medication assessments by a licensed pharmacist. The pharmacist will meet with a patient to review the medications they are on and their ailments, while also covering topics such as medication side effects and quality of life. The pharmacist will make recommendations to adjust the patient’s medications, and provide a report back to the patient’s physician, which details the adjustments. “We’ve had very positive feedback from the healthcare community,” said Dr. Derek Jorgenson, MAC Director. “In a recent survey, 97% of physicians reported that our recommendations were helpful." Recommendations and consult letters were extremely helpful. Absolutely will recommend the MAC to my colleagues. Thorough, evidence based recommendations. Patients have loved it. Medication assessments are also provided under the Saskatchewan Medication Assessment Program through community pharmacies, but the MAC pharmacists aim to provide the service for people who have trouble accessing this program for a variety of reasons. MAC also provides medication assessments for people covered under the federal health system, such as First Nations people. Pharmacy students have the opportunity to volunteer at MAC on campus or through the satellite clinic at SWITCH. These volunteer hours are outside of their regular classroom learning. Students work with the pharmacist on the medication assessment, and experience cases which are generally more complex than those seen in class. “I volunteered because I was looking for ways to gain practical skills outside of the classroom, and apply the concepts taught in class,” said third year pharmacy student Heather Hodgson, who regularly volunteers for MAC at the SWITCH clinic. “MAC has given me the opportunity to learn from pharmacists leading real world medication assessments, and this experience has reinforced what I’ve learned in the classroom,” added Caytlin Crooymans, who is also in third year pharmacy and volunteers for MAC. A partnership between MAC and the SWITCH clinic was established in 2015 to increase access to medication assessment services. Dr. Jaris Swidrovich provides medication assessments during SWITCH’s Wednesday night clinics, which also includes team debriefs on every case. Students from all of the health science colleges have the opportunity to volunteer at SWITCH. MAC is also staffed by Eric Landry, MAC Coordinator, and graduate student Katherine Lysak.